Our House Sydney & Soul Of Sydney are proud to be presenting another Sunday afternoon SPIRIT OF HOUSE event featuring one of the true champions of DISCO & EARLY HOUSE sound. 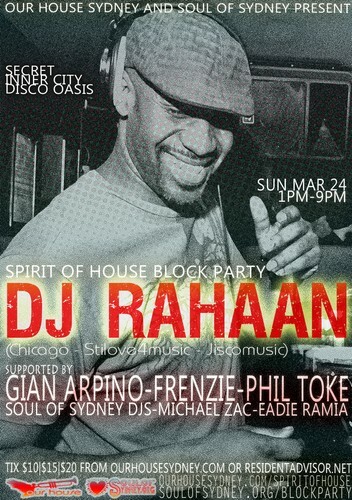 We are delighted to have renowned Chicago DJ & Producer, DJ Rahaan gracing the turntables in March. Rahaan has been playing everything from DISCO, BOOGIE & FUNK & EARLY CHICAGO HOUSE since the 1980’s & comes to Sydney to play a very special Sunday afternoon set where he will be paying special tribute to the SOUL, FUNK, DISCO, CHICAGO HOUSE musical roots & inspirations that have shaped him as a DJ & Producer.